Over 2,000 community and Nationals supporters attended this event. The Gay Men’s Chorus of Washington sang the national anthem and local AIDS expert Dr. Moody Mustafa threw out the first pitch. Over 2,000 attended in 2007, too.See Team DC for info and tickets. 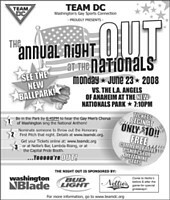 Washington Blade (June 20, 2008): More than 2,000 fans expected for gay baseball event. Picsfrom 2007 event. Article and pics (PDF) from Washington Blade (2007). Celebrate LGBT Pride while enjoying a night of fun, baseball, and recognition for volunteers, friends and allies of the San Diego LGBT community. San Diego GALA Choruses of San Diego who will sing the National Anthem. See www.padres.com/pride for event info and discounted tickets. Enter promo code: PRIDE. “…this special ticket package includes a seat in the LGBT Night section as well as a pre-game party and free drink of your choice!” See www.sfgiants.com/specialevents for event info and tickets. Beginning in 2001, “Out at the Ballgame” at Wrigley Field is the longest-running “gay day” with a MLB team. See Chicago Free Press for info and tickets. Join the LGBT community at Citizens Bank Park for a night of fun and baseball. For info and to order tickets, see PhillyGayDays.com. Get the official T-shirt. The Long Beach Armada will host Pride in the Park night on Saturday July 12, 2008. Click on flyer for details. The Gay Men’s Chorus of Washington D.C.perform the national anthem, 2007. The second Night out with the Nationals, 2006.